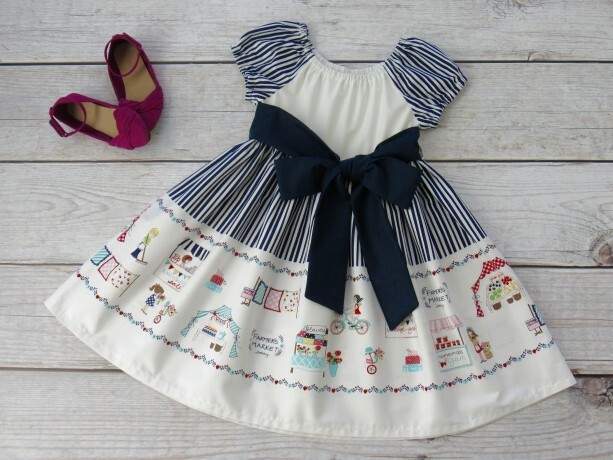 Made to Order Girl Dress. Made of High Quality 100% Cotton Fabric. Pull up dress with cotton fabric sash. Ships: 10-14 business days Handmade in USA Children's Size Chart: -Size 1/2T: Chest 19" -Waist 19" -Length 19.5" -Size 1T: Chest 20" -Waist 19.5" -Length 20" -Size 2T: Chest 21" -Waist 20" -Length 20.5" -Size 3T: Chest 22" -Waist 20.75" -Length 21" -Size 4T: Chest 23" -Waist 21.5" -Length 21.5"